This article helps you to make a Light Sensitive Morning Alarm circuit. The morning light is sensed by an LDR (Light Dependent Resistor) or Photoresistor and it triggers the alarming section. The circuit generates a melodious tone when light falls on it. Wire-up the circuit as shown in schematic diagram and place the LDR next to the window pane closer to your bed. The LDR is more sensitive to light, so make sure it will not be false triggered. All the electronic components used in this circuit is cheap, so you can make this at your own home at very low cost and it consumes very less power, hence it ensures long working life. The light sensing part consists of a Light Dependent Resistor (LDR) or a photoresistor, which is a two terminal device having the capability to detect light (Photons). The LDR decreases its resistance when suitable amount of light falls on it. 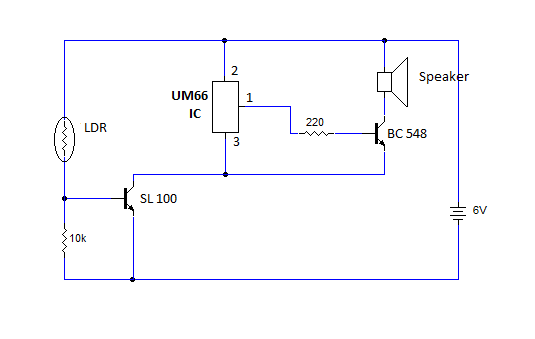 The working principle of this circuit is based on the switching action of an npn transitor (SL 100). As i mentioned above, the LDR conducts current (Lowers its resistivity), when light falls on it and make the transistor switched ON. The alarming section of the circuit consists of a Melody Generator IC (UM66), an NPN transistor (BC 548) and a Speaker. The output voltage from the Light Sensor Section is used to drive the alarm. The tone generated by UM66 is fed to the base of an NPN transistor, inorder to amplify the signal enough to drive the Loud-Speaker. The whole circuit is powered by a Single 6V battery.